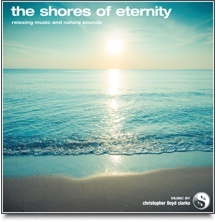 The Shores of Eternity is the kind of album that you’ll listen to when you want to enjoy a serene, uplifting atmosphere while you go about your day. Ocean wave sounds, flutes, acoustic guitars and angelic choirs all play a part in this enchanting music. Another delightful composition by Christopher Lloyd Clarke - gentle and simply heart warming. Pan flutes can be such a playful instrument – they have an innocence and lightness to them that always reminds us of going on holidays and getting lost on some tropical island in a faraway corner of the world. That’s the kind of memory that this music aims to provoke; freedom, playfulness and the lightness that comes with completely losing track of time. Ocean wave sounds, flutes, acoustic guitars and angelic choirs all play a part in this enchanting music. The Shores of Eternity is the kind of album that you’ll listen to when you want to enjoy a serene, uplifting atmosphere while you go about your day. You certainly don’t have to sit cross legged with your eyes closed to enjoy it. This gently uplifting music plays for a full hour, creating a space that you can really relax into. It’s music that will keep you feeling light, positive and relaxed, even while you are busy doing other things. Take a trip to The Shores of Eternity and let your worries drift away. This is “music for living happily and peacefully”. We hope that it will bring you peace and joy.